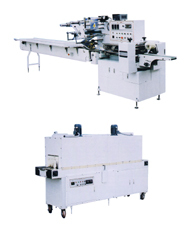 Model TNR Automatic Shrink Tunnel Application: Used for shrink film wrapping and making the result perfect combined with model SBB Automatic Shrink Wrapping Machine Features: 1. Compact structure, easy operation, reliable working, low cost and low maintenance. 2. Quick heater. 3. Automatic temperature control. 4. Quick and simple change over via easy adjustments.